Anyone above 18 years of age can join Oriflame for free. 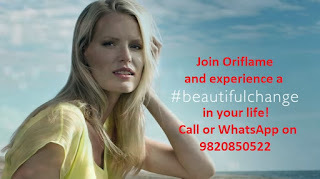 Both men and women can join Oriflame in Mumbai, Pune, Bangalore, Hyderabad, Nagpur, Thane, Delhi, Noida, Kolkata, etc. What is your purpose of joining Oriflame? Oriflame business can give you cash income, gifts, cheque income, foreign trips, name, fame, self respect, recognition, etc. You can call or WhatsApp Mrs Jashmi on 9820850522 and she will guide you. You can join an an Oriflame consultant and if you want to make lots of money with Oriflame by becoming a Manager, Senior Manager or Director, let me know so that I can guide you accordingly. If you be in touch with me on daily basis, then everyday you will learn something new from me and in a few months you can become an Oriflame Director. I was on this ship in 2017. It was a fabulous experience. Each year Oriflame takes us to a new location. Do you want to have a world tour for free? Join my team and learn from me how to do the Oriflame business systematically and make loads of money.